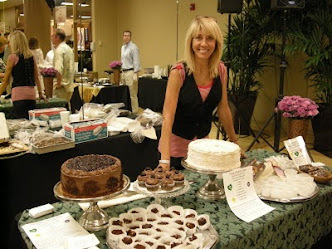 Thank you to everyone who came out last weekend - yes, the Carrot Cake was quickly gone. I met some very young vegans at the Sahuarita Food Festival - one, Caleb, has gotten his mother to go vegan, and is now working on his younger brother - good for him! Here I am at St. Phillips last Sat, wearing a dress I got from another vendor, Rainy Arizona. This Saturday, I will be at St. Phillips as usual, 8 am to 1 pm. I will bring Pecan Tarts and Organic Apple Pie (with a whole-grain, almost 0 fat spelt crust), amongst other items. On Sunday, ENVISION TUCSON SUSTAINABLE FESTIVAL will be held this year at the YWCA at 525 S. Bonita, 11 am to 4 pm. I will have a good selection of savory and sweet items there -- all made without salt (I use the fresh greens and herbs that we grow instead, for more interesting flavors), no oil, no GMO's, and of course, no animal products, and no cane sugar or refined flour. This festival is FUN; we did it last year and are glad to be part of it again! Pumpkin Cranberry Muffins, Orange Coconut Pineapple Coffee Cake .